For a while now I've been threatening to work on a new theme for DNN, a new package building on Bootstrap 4 (currently Beta-3) to provide an alternative to my HammerFlex skin that I first released in January 2014 (yikes, where'd the past three years go?). With all the security updates and issues with the best CMS for .NET lately, you should have performed a few version upgrades in recent weeks. If you haven’t, shame on you, get to it! If you’ve setup a new DNN site running on version 9.0 or 9.1, you’ll notice that you don’t have the ability to setup the Google Analytics module/code anymore. For some reason, DNN Corp in its infinite wisdom decided to remove the core, critical functionality from the Platform version of DNN and only leave it in the paid versions. Well fear not, you can easily add Google Analytics code to your pages, follow these steps. Depending on what the "source" is, it appears that DNN 9.0.1 was released either 11 days ago, or 3 days ago. So which is it, 11 or 3? Who cares, let's just go over some of the basics of what the release covers. DNN9 appears to be an evolutionary leap forward for the DotNetNuke CMS, but while there are many advances, there are some big misses of features that somehow got left behind, or at least hidden away so that finding them for someone who isn’t a DNN expert (such as myself, if I do say so) is impossible, unless of course you read this blog, then you’ll be on your way to utilizing DNN9 in ways that the average Joe could only hope to. I woke up this snowy January morning with email from my most excellent web hosting company (www.appliedi.net) letting me know that my database server was almost out of hard drive space. Thanks for the heads up to the AppliedI team! My first thought was “How is that possible?” I was just on the server in the past couple of days doing all my DNN9 upgrades, and there were 20 gigs of free space not 4 days ago. With a quick check I found that one of the databases was 9gb. 4 days ago that database was <250mb. With the release of DNN Platform 8 last week it is now possible to develop modules using SPA and MVC patterns within the DNN platform. As Part of the buildup of the DNN 8 release, Will Strohl provided a Pull request to my DNN Extension Project Templates project to help clean up some of the basic module templates to work better on Windows Azure environments, and to prep them for inclusion of new DNN 8 specific templates for SPA and MVC modules. Early in the fall Joe Brinkman provided a partial SPA project, with the intention of it becoming a project template. I had a little time when it was initially submitted to work on it, but wasn’t able to get everything squared away on the template until early December. It wasn’t until last week that I got additional time to do further testing on the template and fix a few issues that occurred during the conversion to a project template. With the release of DNN 7.3.0 this week, it was time for me to get my sites upgraded. I upgraded most of the sites without any issues, but wanted to point out a few errors that I received on sites, and how I resolved them. The very first upgrade I did started out bad, it was for this site, and while the upgrade was 100% successful, as soon as I tried to load the site I got a generic 500 error. Accessing the site from the webserver gave me a little more information, seen below, but not much. One of the things I’ve failed to do with my latest free open source skin, HammerFlex, for DNN is provide a good overview of how to utilize the skin. To really understand a skin, one must know the layout, and the thought process behind the layout (panes). A month or so ago I released a new open source skin for DotNetNuke (DNN), called HammerFlex. One of the cool things about the HammerFlex skin is the implementation of Bootstrap, and specifically the Carousel feature that allows you to add a carousel/slider to your site. The skin is designed to use the carousel at the top of a page, I haven’t tried it elsewhere, though it might be possible to use in other Panes in the DNN Skin. 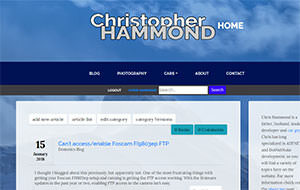 I decided recently it was time to upgrade the look of my various websites, and while I originally considered modifying my MultiFunction skin for DNN, ultimately I decided to start from the ground up and create a new Skin for DNN using Bootstrap (http://getbootstrap.com), I’ve decided to call it HammerFlex. My website was due for an overhauled design, somehow a full year came and went and I hadn't done any major updates to the website. I guess that is what happens when you, move, change jobs, and have a second child in on year, time sort of magically goes away. A couple of weeks ago I started working on a new DNN skin, to replace my MultiFunction skin that I've had in use here on ChrisHammond.com for a number of years now. Initially I was going to work on upgrading MF, but after giving it some thought, I felt like I wanted to start over, and this time around I wasn't sure that I was going to create an open source skin, most likely just something that I would use for my own websites, of which I have plenty to spread the skin around on. Where have all the DNN Tutorials gone? 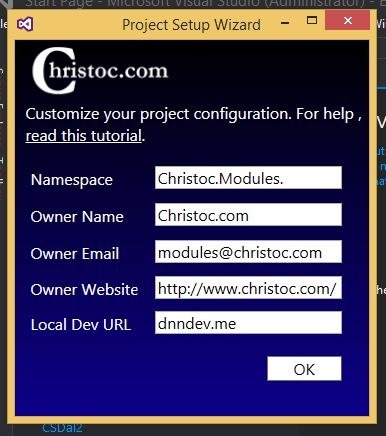 Earlier in 2013 I started working on a new round of DNN Module Development tutorials. For a few months now I've been promising that I would finish up that series, but at this point I am going to announce that the series is on hiatus. There are a number of reasons for this, the primary of which is that I am simply too busy. My work role at ClubReady, Inc. has changed over the past month, was promoted to the Director of Customer Experience leading a team of 14 other folks, including developers and customer service staff. In October, the SignalR project had their first official 2.0.0 release, and with that comes a number of changes to make your modules work with SignalR. You can upgrade your SignalR package via Nuget. In a previous blog post I talked about what you can do to get DNN 7.1 working if you previously had Xepient's Open Search installed. One thing I failed to cover though, was what happens after you disable open search? You likely no longer have the DNN Search Results module on a page, and after upgrading to DNN 7.1.2 (I didn't notice this in 7.1.0) you may find that the "Preview" search results in the Search SkinObject no longer work. You may not actually notice, but if you try to "search" and you just get redirected back to the page you were on when you searched, you likely are running into the problem I have a fix for below. I upgraded a number of websites to DNN 7.1.2 tonight, and I ran into two different problems, this blog post will hopefully help you address the issues that I ran into, if you happen to run into them as well. Disclaimer: Always backup your website/database before making any changes or running any SQL scripts you got off the web. I don't take any responsibility for damage you cause to your own website, but if you need consulting help with your DNN site, I am available. In a previous blog post I talked about how to use SignalR with your DotNetNuke modules, well, if you are using DNN 7.1 and the "Advanced" URLFormat option (upgrades won't use this by default, new installs will) then the SignalR/Hubs route will no longer work, DNN will return a 404 for that path. What you need to do is "override" the URL settings in DNN. In the DNN Platform, you have to do this manually, via the database, I believe the EVOQ ($paid$) versions have a UI for this, but for those of us who focus specifically on the open source platform, you need to make manually update database entries to customize the URL handling in 7.1+. I was upgrading a customer's website this evening, in a test environment thankfully, and ran into a problem. The upgrade appeared to run successfully, minus one little issue with a primary key (in the 6.0.0 script). But after running the upgrade, the website wouldn't load. I kept getting an error in Chrome, and then finally started getting 503 errors as the server shut down the application pool completely. I have released version 2.2 of my open source DotNetNuke Module Development Templates. Version 2.2 is really just a minor update for the release, with a couple of fixes, one big, and the rest fairly small.